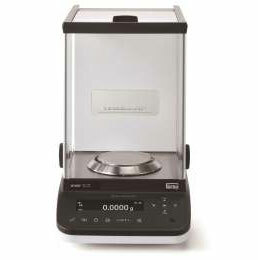 Shimadzu analytical balances boast a one-piece UniBloc weighing sensor, which is now even more advanced. The improved UniBloc sensor offers up from 7 seconds (previous model) to 1.5 seconds faster response. A new ionizer is able to remove static electricity in about 1/10 the time of previous ionizers This unit allows acquisition of reliable weighing results by eliminating static electricity that can affect measurements without scattering powder. Equipped standard with an RS232C connector, a USB device and a USB host. You can now simultaneously send output to both a computer and printer or connect a USB flash drive, a barcode reader, or an external numeric keypad. Because the pixel elements in the organic electroluminescence display emit light, the screen can be seen clearly even in dark locations. Multi-language display capability* provides a more intuitive operating interface. A wider viewing angle has also improved the visibility of measurement values, which helps increase the efficiency of measuring operations. The visibility remains the same even when viewed from different angles. The viewing angle is a wide expanse of ±85 degrees, both vertically and horizontally. That means the display is clearly visible even when working beside the balance. A high-resolution dot-matrix display makes it easy to read even detailed text. Weighing display can be recorded into USB memory in BMP format. User name, date/time, setting can be done with display information. 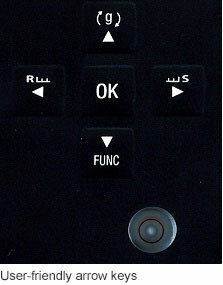 Connecting a common external numeric keypad makes it easier to enter numeric values. This is especially useful for entering the mass value of weights, setting upper/lower limit values for the comparator function, or entering the sample count during piece counting mode. A barcode reader can be connected. Simply reading a barcode makes it possible to input user ID/Password. It is possible to manage sample IDs using barcodes. AP series supports periodic inspections. The function allows inspection of repeatability, corner load error, and linearity by simply following instructions displayed on the screen. Preparation recipes for commonly used buffer solutions are provided as standard. The target weighing value is shown on the display and analog bar in order to compare the target with the current weight. Manual calculation is not needed. Record output with date, time and operator name. Typically, preparation of a standard sample solution requires tedious calculations. 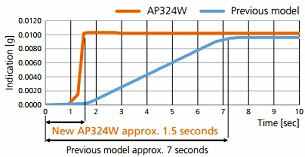 AP series simplifies the process with automated calculations. Operations can be kept secure with user ID and password protection. Access rights can be specified separately for each user to prohibit unauthorized actions such as performing calibration or changing the settings. User IDs can also be used for barcode management. Reproducibility can be confirmed by repeatedly measuring weights as instructed by AP series. The minimum sample quantity is automatically determined from the standard deviation and recorded in AP series. If the minimum sample quantity requirement is not satisfied during measurement, an indicator flashes to warn the user. Functionality for customizing the content of printed information supports compliance with various ISO, GLP, GMP, and other requirements. Sample recipes can be registered, allowing users to simply follow instructions on display. Weighing results and analysis results can be stored in a database. Reports can be generated according to results in a prescribed format. Response and stability settings can be changed during measurements with a single touch. Changing the settings for different applications can make it even easier to use. The indicator is operated using the left and right arrow keys. Moving the setting toward [R] prioritizes response, which makes it easier to operate the balance. Conversely, moving it toward [S] makes it easier to stabilize weight values, which can improve readability in environments with vibration. A Perfect Self Calibration (PSC) function is included. The analytical balance automatically detects any temperature changes that could affect sensitivity and automatically starts calibration. The clock-CAL function enables automatic calibration at a pre-specified time (for example, before starting work, during lunch, or after work hours). 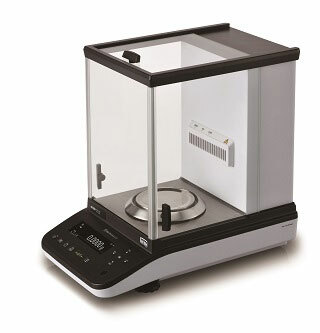 In combination with an optional specific gravity measurement kit, the balance can be used to measure specific gravity. By using sinkers, the specific gravity of liquid can be measured as well. This allows measurement of the specific gravity of metals, rubbers, plastics, and other materials easily. Response Time *2 Approx. 2 sec. *1 According to USP Capture 41. This is the tested value by the weight of the balance's capacity of 5%. *2 The response time value is typical.